Today’s blurb is going to be centered around a product review. I love my nails looking fresh whether that be with acrylics, a sleek paint job, or in this case stickers. Yep ya heard me stickers! Now I love painting my nails and getting funky with my designs but it doesn’t take long before those darn paint chips start flaking off. I hate that more then anything, you put so much time into painting them for them to just flake off in three, four days, drives me nuts. 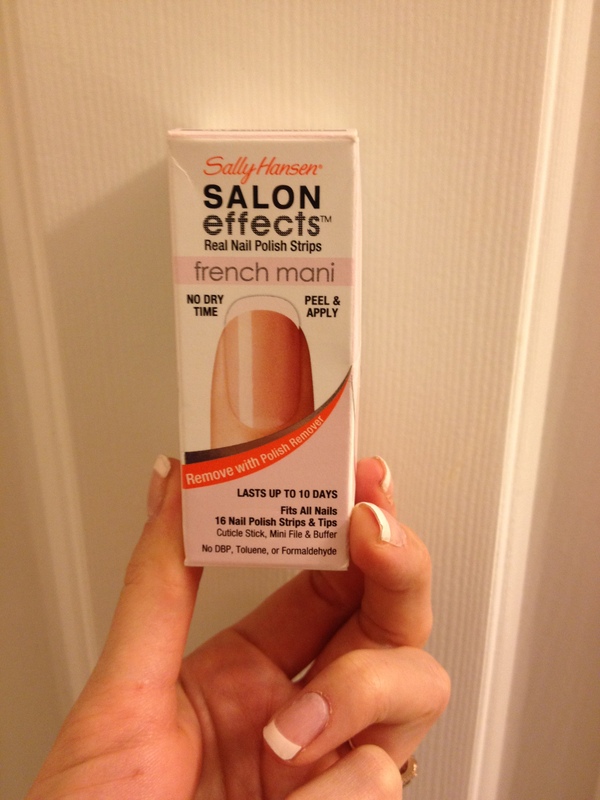 So while on my hunt to find a miracle of a top coat I came across these Sally Hanson french Mani nail strips. I was a little skeptical at first but thought, wow this looks bomb digity easy I gotta try it. So during the worst Super Bowl ever (Niners fan, bummed they didn’t make it. ) I just put these strips on and bam! They were finished and looked superb! The box says they last at least ten days, I am on day four and they are still shining for me. I do not do any hard labor or very much deep cleaning right now, I just type on the computer for work all day so that is about all the trauma my nails go through. But I love this new find and they have super cute designs that I am going to go back for, so I definitely recommend them. I am however, still pretty old school and love painting my own nails so if anyone knows of the ultimate top coat holla at me cause I’d love to try it out. Let me know what you think of these nail strips. QUOTE OF THE DAY: If you have good thoughts, they will shine out of your face like sunbeams and you will always look lovely.